ATEM Studio Converter is the ideal partner for the ATEM Camera Converter. Connect up to four Camera Converters via optical fiber up to 28 miles away with bi-directional video plus tally and talkback! Connect your ATEM switcher program output to the ATEM Studio Converter and this is distributed to the four Camera Converters. Multiple Studio converters can be cascaded together when more than 4 cameras are needed. 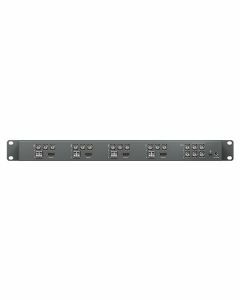 Studio converter can also be used as four independent SDI or Fiber to HDMI converters and four independent simultaneous SDI to Optical and Optical to SDI converters. Optical Fiber Link Work over lengths of up to 28 miles! ATEM converters connect using industry standard single mode optical fiber cable with standard LC connectors. Optical fiber lets you connect way beyond the distance of traditional copper cables. It’s widely available, easy to use and affordable because it's the same optical fiber cable used in computer networking. ATEM Camera Converter and ATEM Studio Converter use the standard SMPTE specification for optical fiber connections using standard single mode optical fiber running at 1310nm, which allows you to connect at distances up to 28 miles! SDI Video Input: 1 x 10 bit SD/HD switchable program input from switcher, including tally information. SDI Video Output: 4 x 10 bit SD/HD switchable camera outputs. 1 x 10 bit SD/HD switchable program loop thru output connects to another ATEM Studio Switcher. Talkback Audio: Aviation Headsets with 0.25" TRS headset connector and 0.206" TRS microphone connector. Front mounted balanced XLR microphone connector. Analog Audio: 1 x stereo RCA monitoring output. AES/EBU Audio Input: 1 x combined headphone input. 1 x combined microphone input. Combined inputs for connecting to other ATEM Studio Converters. AES/EBU Audio Output: 1 x combined headphone output. 1 x combined microphone output. Combined outputs for connecting to other ATEM Studio Converters. Balanced XLR Audio Output: 4 x camera stereo analog audio outputs. Optical Fiber Video Input: 4 x single mode SD/HD switchable camera inputs with LC connector. Optical Fiber Video Output: 4 x single mode SD/HD switchable camera outputs with LC connector. Optical Fiber Audio Input: 4 x single mode camera audio inputs with LC connector. Channels 1 & 2 are camera audio. Channels 15 & 16 are intercom audio. Optical Fiber Audio Output: 4 x single mode camera audio outputs with LC connector. Channels 1 & 2 are camera audio. Channels 15 & 16 are intercom audio. Computer Interface: 1 x mini-B type USB 2.0 connector for firmware updates. Multiple Rate support: SDI switches between SD and HD. Software Included: Converter Utility for firmware update.